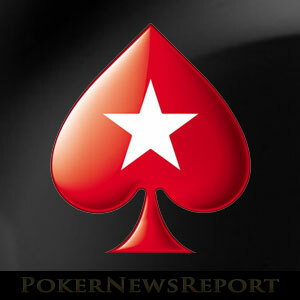 Home » Poker News » Online Poker News » How Much Could You Save by Reinstalling PokerStars? 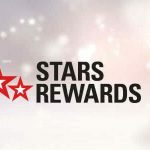 How Much Could You Save by Reinstalling PokerStars? Last weekend, the team at PokerNewsReport get around to doing some long-overdue housekeeping on their computers. As a rule that generally consists of deleting old files, doing a disc clean-up and defrag. Occasionally we might even get the hoover out to give the hardware a clean. This time around, we also uninstalled some unused programs. Naturally, the more you play at one particular poker site, the more data will be retained (hand histories, player notes, logins, etc. ), but it seems PokerStars tends to save far more data than any other site. Ultimately, if you don’t address the ever-increasing volume of space the program is consuming on your hard drive, it could eventually exhaust your free space and your computer will stop working altogether. The amount of space consumed by PokerStars´ software is not a problem unique to the PokerNewsReport team. A quick search around the Internet shows plenty of players querying how to address this issue and save space on their computers. The most commonly-suggested solution is to uninstall and reinstall the software, but some players – wishing to prevent the loss of their settings and other data – purchase a separate hard drive. The way to uninstall PokerStars without losing data is to first make a backup of the data files you want to keep for the future. These can be found by going into the PokerStars client. On the right hand side of the client you will see a link reading “More”. Click on this link and then the link to the “Help” screen, and you will be given the option of opening your settings folder. If you have a Windows operating system, when you click on “Open My Settings Folder”, you will be taken to the folder on your computer in which your hand histories, player notes and other data are saved. The only files you need to backup are user.ini and notes. [username].xml, and these should be copied and pasted somewhere safe and accessible. If you are a Mac user, contact PokerStars customer support for the appropriate files to copy and paste. You can then uninstall the PokerStars software via the Control Panel (Windows 7, 8, XP and Vista) or via the Apps & Features utility (Windows 10). 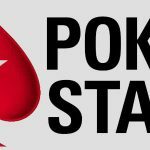 Once the software has been deleted, it is a good idea to use the search facility to look for any remaining PokerStars program or settings files and delete these if you find them (obviously not your copied files). Then restart your computer. 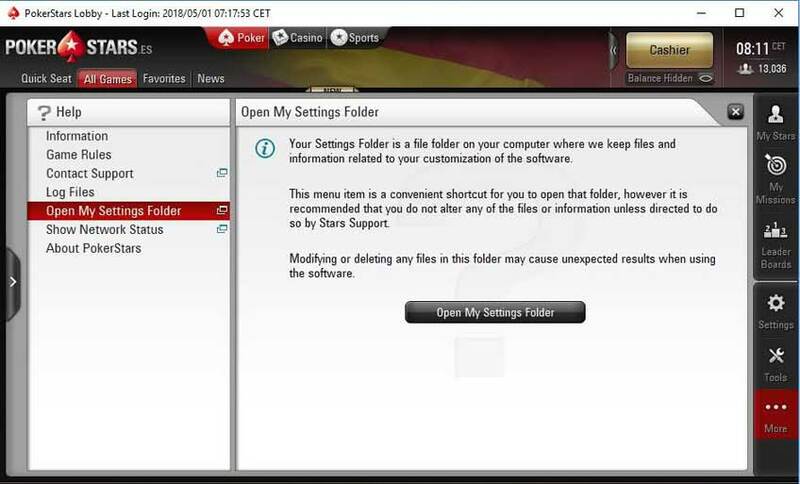 Before reinstalling the PokerStars software, it is recommended to check you have Administrator rights otherwise the software may not run when you log into it. In order to do this, key “UAC” into the search bar (alongside the “Start” button) and, when the “User Account Control Settings” page appears, make sure the blue slider bar is on the second option from the top (the “default” setting). Then visit the PokerStars website appropriate for your location (.com, .eu, .es, etc.) and download the PokerStars software. Once the download and installation process is complete, log in with your usual username and password and go to “More” > “Help” > “Open My Settings Folder” (as above). When the settings folder is open, close the PokerStars software. Then replace the user.ini and notes. [username].xml files in the settings folder with the files you previously copied and pasted into a safe and accessible location. Once you have completed the uninstall/reinstall process, it is worth looking at the size of your PokerStars folder to see how much space you have saved. Depending on the volume of time you spend playing at PokerStars, you might want to set yourself a reminder to repeat the process next year. The alternative could be finding your computer does not work one day because your hard drive is full of PokerStars´ data.